UNDER THE PAVING STONES, the beach, as the old rallying cry goes—but these days, from Paris to Baltimore to Tahrir Square, the vision of some radical utopia lying just beneath our streets seems more chimerical than ever. And yet art persists in envisioning a different politics—repeatedly testing whether a revolution in perception, in how we see, might instigate a revolution in the world, in how we live, whether through history painting or Productivism, institutional critique or social practice. 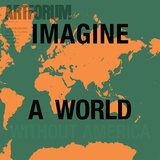 At a moment when long-held distinctions between Left and Right, populism and vanguardism, extremism and consensus, reality and reality television, have been precipitously and unceremoniously upended, we invited a select group of artists to create projects specially for Artforum. Following a reprise of Zoe Leonard’s ever-more urgent I want a president . . . , 1992, new works by Dread Scott, Eileen Myles, Simone Leigh, and Wolfgang Tillmans address our fraught political season on the eve of the US elections. Each is in some way a reflection of—or a call for—art in action.